This pretty park in Media, about 16 miles from Philadelphia, includes a paved, ~5 mile multi-use path that loops around the perimeter of the park, plus 13 miles of additional trails cross Ridley’s interior (unpaved, varied terrain). The multi-use trail also connects easily to the Tyler Arboretum, where runners will find 17 more miles of trails. These shady paths along the creek are a good option for a hot sunny day. 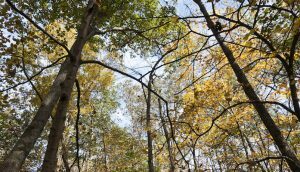 The flat trails of Heinz Wildlife Refuge, the first urban refuge in the U.S., offer a great taste of trail running for those who want to experience a little natural beauty without too much travel or technical footwork. 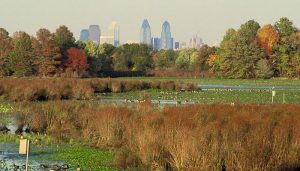 The refuge, just a few miles outside Philadelphia, has 10 miles of trail around Tinicum marsh with great skyline views. The eastern end of the park is the most scenic, and includes some fun sections of boardwalk. Sometimes known as the P&W Trail, this multi-use path is a 2.4-mile stretch of macadam and crushed stone. It runs through much of the Wayne area, beginning at Radnor-Chester Rd. in the east and ending at Sugartown Rd. in the west. A scenic rural and residential run, this path features some rolling hills. The Chester Creek Trail is one of the go-to runs in Delaware County. After 20 years of planning, 2.8 miles of the trail are in place, and measures are in order to expand the route to nearly 7 miles. 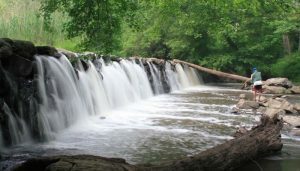 The trail currently reaches from Lenni Road in Middletown to Knowlton Road in Aston, bordering the creek of the same name and passing by gorgeous mills and waterfalls. To extend the route, combine with the Linville and/or Orchard Trails, dirt paths which continue through orchards and farmland. 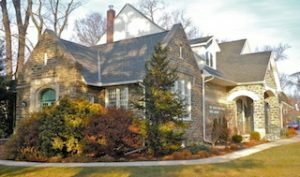 The trails of Haverford Reserve offer a variety of running opportunities, from the macadam Parkview Drive path to the scenic dirt Meadow Trail. Combine 5 miles of paths through forest, stream, and meadow, with a few options for hillwork. To extend your run, hop onto the Darby Creek Side Trails. Located between Media and Springfield, Smedley Park is a 120-acre public space with a number of hiking trails, including the Smedley Yellow Trail and the Trolley Station Trail, which can be combined for about 3 miles. For a longer, more varied, run, head south under the Baltimore Pike to Swarthmore College’s Crum Woods trail system, where you can pick up an addition 3.5 miles of trails. The Valley Walk Trail and the Leiper-Smedley Trail are favorites. 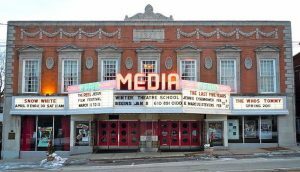 For pavement pounders seeking a residential run on safe, well-lit streets, look no further than the course of the Media 5 Mile Race. The official event takes place on the third Friday in June each year, but the route is popular among local joggers any day (or night!) of the year. The course through “Everybody’s Hometown” primarily uses E. State Street, E. Front Street, Olive, 8th, 6th, and Edgemont, hitting downtown Media as well as some pretty residential streets. 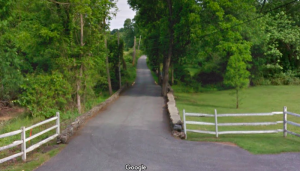 The trails of Powder Mill Valley, which span through parks, mill buildings, and the neighborhoods of Havertown, offer bouncy woodchip running for about 2 miles. They can easily be combined with the Darby Creek and Haverford Reserve Trails for more mileage. 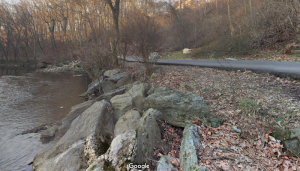 Aside from our route from the movie Rocky, joggers in the Philly suburbs can take on another type of “Rocky Run” with this 2.5 mile dirt, grass, and cinder path along the Rocky Run Stream. It’s a beautiful, secluded route through the woods, along the creek of the same name, with some challenging hills to spice it up. On the west end, the path crosses over the creek and meets the Darlington Trail, a 2.75 mile loop. To keep going, add on the 1.25 mile Cornucopia Trail, which starts on and loops back to the Darlington Trail. 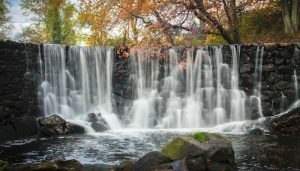 All in all, there are about 9 miles of great running here, which can be extended into the Tyler Arboretum and Ridley Creek Park. 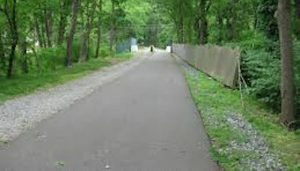 Beginning in Newtown Square, the Goshen Road Trail is a popular 1 mile crushed stone path paralleling the street. 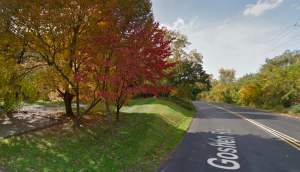 With the recent creation of the Liseter Trail, runners can connect Goshen Road to the trails of the Newtown Meadow Preserve, resulting in a run of about 5-6 miles. 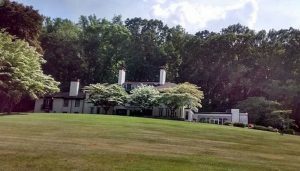 A 47.5-acre estate in Radnor, The Willows offers unique, beautifully landscaped grounds that are great for a run. There are three separate dirt paths here, allowing for 4-5 miles of running through forests and open fields. 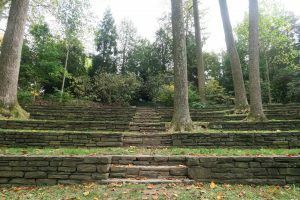 Right next door, the hiking trails of Skunk Hollow Park and Saw Mill Park can extend the route. 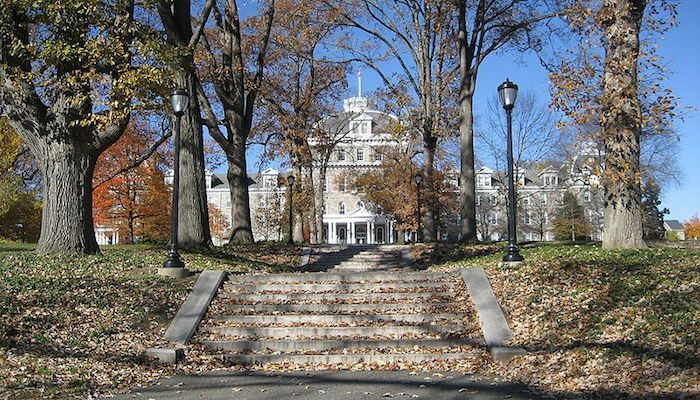 For a nice paved run on quiet residential streets, the area around Swarthmore College is a good bet. Leafy roads, sidewalks (or otherwise low-traffic areas), and lots of pretty homes to look at along the way. A few good choices are Yale Ave, South Swarthmore Ave, and Michigan Ave. Add on side streets or the Crum Woods trails for more mileage.